Blessing one of the most electric players in the majors, @solesbysir had Harper in a one of one pair Supreme x Louis Vuitton bustoms on opening day that would make YG big jealous. More sick custom work from @solesbysir with these throwed pair of Vans Sk8-Hi inspired Under Armor Harper 2 RM worn Players' weekend. 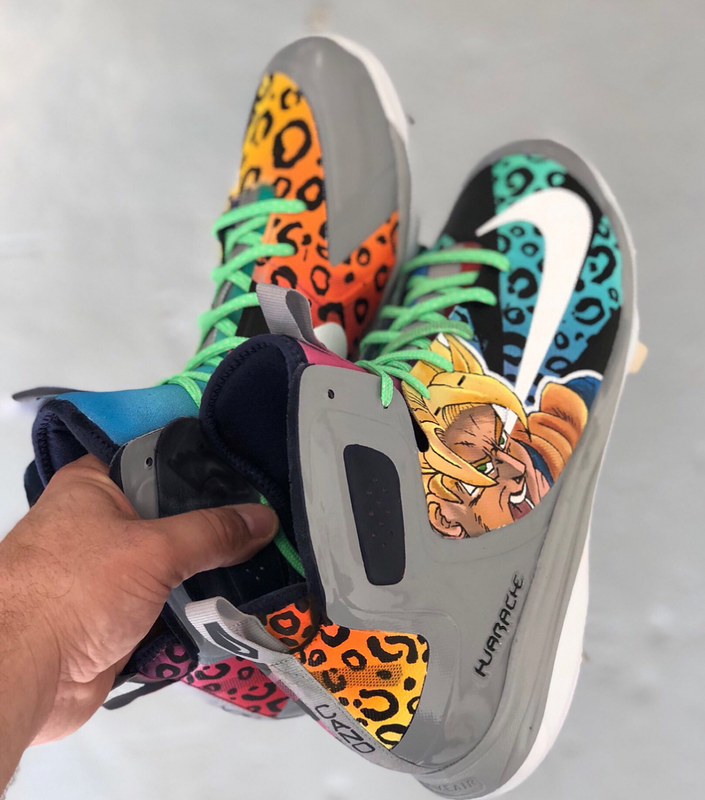 @mach275 hooked the 2nd baseman's Nike Huarache with a DBZ Goku x Cheetah print custom art. Colors going stupid tropical edition. 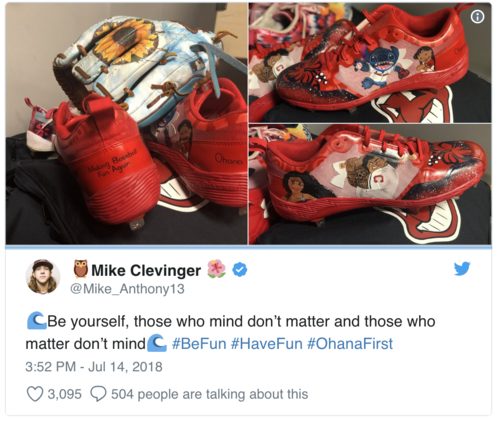 How can you not rock with Ohana themed Disney inspired Under Armor x Lilo & Stitch/Moana custom art? Like forreal?! And if you were wondering who had the best cleats during MLB Players’ weekend…WINNER WINNER BIG CHICKEN DINNER. 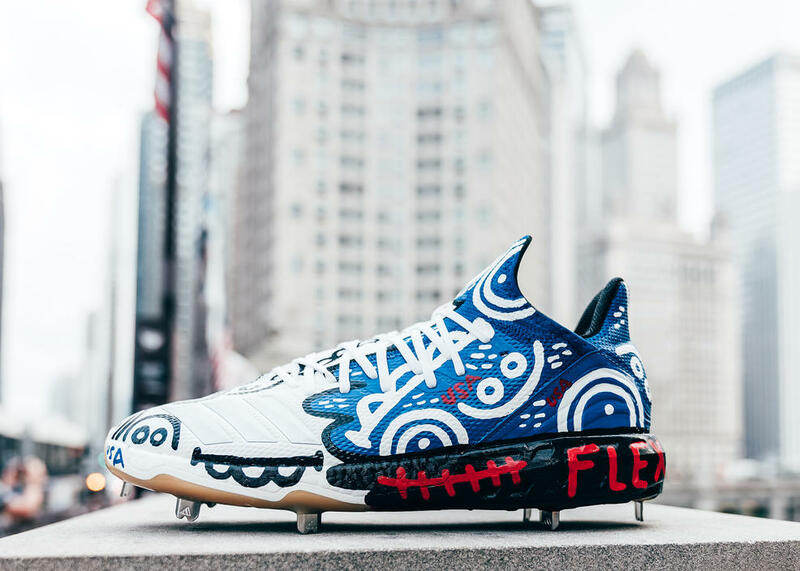 These Under Armor’s feature custom art of the greatest guitarist of all time, Jimi Hendrix; with these Clevinger earns his title as wave god and sits alone on his throne when it comes to custom cleats. Go ahead and stare at these for a sec and feel the psychedelic effects provided by the layers of tie dye all through the forefoot. Up and coming designer Naya Fowler made a big splash with Jordan brand, helping her daddy out with the creative direction behind these Air Jordan XI cleats. Naya why you have to break em off with the glitter rainbow outsole? Looking forward to the 4 year olds next work. Your granddaddy’s favorite walking shoe has inspired the likes of Puma, Adidas, Under Armor, Gucci, Balenciaga and many other major brands that are now riding the extremely popular and fashion forward, dad shoe wave. Photoed above, Adam Jones is stunting in the classic Nike Monarch with custom art from @kdcustomkicks featuring Jones’ favorite, hella junk food. @ikb20_customs and Jordan Brand spazzed with these Air Jordan IX PE customs showing love to Fenway Park, starring the Red Sox mascot Wally. Honoring the Late great Dale Earnhardt on Players' weekend; Gennett’s Jordan cleats features the patented checkered flag, Earnhardt’s #3, all on black Goodyear tires. 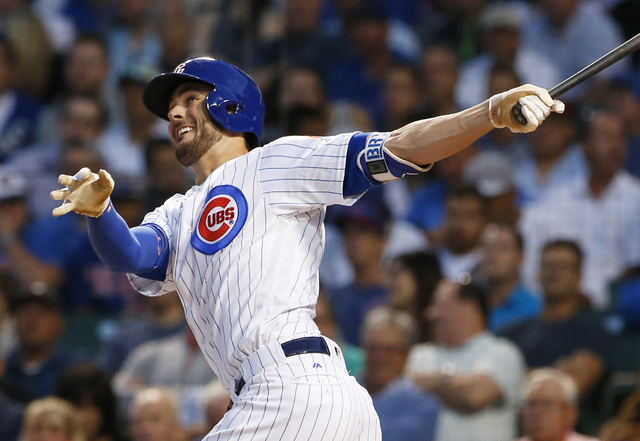 Paying homage to his grandfather, the All-Star 3rd baseman hits the diamond in some cool powder blue Father’s Day Air Jordan IX low cleat. 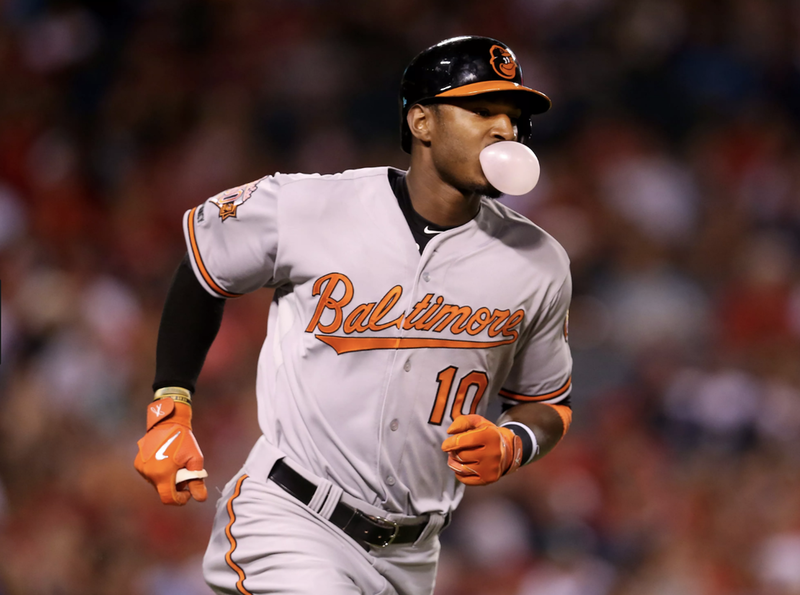 Jordan Brand loves Mommas almost as much as Machado loves Jordan IX lows. Here’s his Mother's Day Pink Rose Air Jordan IX low cleat. One of my personal favorites on the list, Mariners center fielder Cameron Maybin was caught rocking a pair of Nike Lebron 15 "Fruity Pebbles" cleats & went with the pink laces to match on Mother’s Day. So for Players’ weekend Maybin called upon @VictusSports to go sicko mode with the Travis Scott x Air Jordan IV Cactus Jack customs and indeed they delivered. @kdcustomkicks Benny “The Jet” Rodriguez PF Flyer, known for drastically increasing your overall speed and leadership skills; Taylor Motter is fully aware. “Heroes get remembered but legends never die” featured on the side along with every member of the Sandlot gang. These need to be put on display in Cooperstown straight up. Minnesota Twins first baseman linked with @ikb20_customs for these sweet Nike customs. Went with the Paradise x Trout on ya feet vibe. I digg, I digg. Always a huge supporter of hoop shoes getting converted over to the diamond; Rojas took advantage of the OKC Thunder colorways that came with Paul George switching teams. Here he is sporting the Nike PG 1 cleat to perfection. For Players’ Weekend, Marlins’ shortstop requested more sauce and more sauce was what he got. @solesbysir with the beautiful work on these Nike Huaraches with custom mismatching Air Jordan 1 paint job. Jordan Brand laced Gonzalez with Memorial Day kicks to match the kit. These Camo Air Jordan IX are tough to say the least. The Left handed pitcher went codeine crazy on Players' weekend with a pair of custom one of one Air Jordan XI cleats featuring splattered paint throughout the heel and toe box. V. rare. Every Players’ Weekend, Bryant helps support “Wings for Life, a non-profit spinal cord research foundation whose mission is to find a cure for spinal cord injury. Shout out to Lauren Asta, Frank Quintero, and Miss Merlot who were the artists who created & designed the pairs for the former MVP.